Diabetes Beta Cell - Insulin (β cells) under a microscope! Pancreatic beta cells produce insulin which helps regulate sugar levels in the body. Learn how they work and what happens when they don't. Each plush cell contains a zippered pouch. 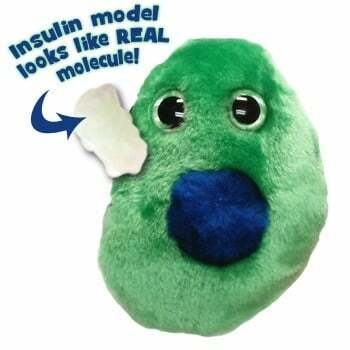 Inside you'll find an Insulin hormone modeled from a REAL Insulin molecule! 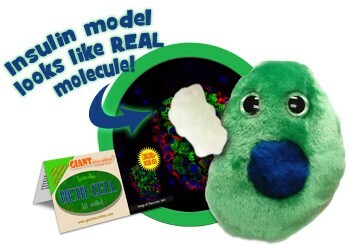 Pancreatic beta cells produce the insulin that helps regulate the level of glucose sugar in the body. When blood sugar levels rise, beta cells release insulin which causes fat and muscle cells to begin absorbing the excess sugar. As a result, glucose levels return to healthy levels – and the sugar is stored for later use as a cellular energy source. Even if the beta cells are still functioning, diabetes can still occur if the body’s fat and muscle cells become insufficiently responsive to insulin – or if insufficient quantities are produced. This Type II diabetes is far more common, and typically occurs in adults. But fortunately, Type II diabetes can typically be managed with dietary modifications, exercise, and sometimes medication. And while Type I diabetes requires the regular injection of insulin, rapid developments in monitoring and delivery mechanisms have greatly improved the lives of those living with diabetes – and biological research is honing in on ways to restore damaged beta cells and cure diabetes for good. 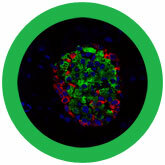 Beta Cells are found in islets of Langerhans, which are patches of endocrine tissue in the pancreas. They make up 65-80% of the cells in those islets. Their main function is to produce insulin, a hormone that tells your body cells to absorb glucose so that it does not remain in the blood. This regulates blood glucose levels. Scientists discovered an extract that had antidiabetic properties, and they hypothesized that the antidiabetic hormone in its pure form came from the insular tissues of the pancreas, which would later be recognized as the islets of Langerhans. This insular derivation caused the scientists to name the substance, that had yet to be isolated, insulin. 10 microns, 1/10 the thickness of a piece of paper. For a rough estimation, say 75% of cells in islets are beta cells. 1 million islets x 1000 average cells in an islet x 0.75 = 750 million beta cells. 1869: Paul Langerhans was the first to describe the islets of Langerhans, which bear his name. 1921: Frederick Grant Banting and Charles Herbert Best discovered insulin. Islets: A healthy, adult pancreas has about 1 million islets. Each islet contains on average 1000 cells. Celebrities with Diabetes: Tom Hanks, Paula Deen, and Halle Berry all have Type 2 Diabetes.